It was a crisp, sunny morning in New York City, with temperatures in the high 40s at the start of the 2018 New York City Marathon. As a spectator, it was a bit chilly standing in the shade for so many hours, and my fingers were stiff as I snapped photos, but I couldn’t complain. After all, 52,000 runners had been waiting out in the cold, hours before they even crossed the starting line. Although the crowds around me at the 17- and 25-mile marks weren’t roaring like in Brooklyn, the cheerful, supportive atmosphere was intoxicating. The first participants of the race—wheelchair division athletes Daniel Romanchuk (USA), defending champion Marcel Hug (SUI) and David Weir (GBR)—zoomed past us at mile 17, and I could tell it would be a race to the finish. 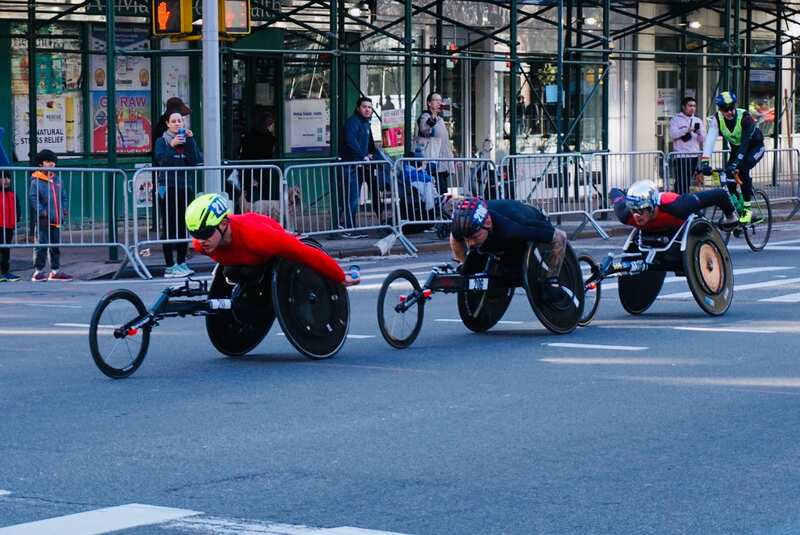 In the end, it was Romanchuk who took gold in 1:36:21, marking the first time in NYC Marathon history that an American man finished first in the men’s wheelchair division. Hug finished second in 1:36:22 and Weir claimed third in 1:36:23. Then, the women wheelchair stars—defending champion Manuela Schar (SUI) and Tatyana McFadden (USA)—flashed past, with no one in their wake. At the finish, it was Schar who held off McFadden to claim gold in 1:50:27, with McFadden taking silver in 1:50:48. The crowd cheered and willed the other wheelchair and handcycle division athletes forward as we waited in anticipation for the elite women runners, who came swiftly with strong legs and calculated form. It was Mary Keitany (KEN), Netsanet Gudeta (ETH) and Rahma Tusa (ETH) leading the pack at mile 17. Slightly behind them came Vivian Cheruiyot (KEN), defending champion Shalane Flanagan (USA), Mamitu Daska (ETH) and Molly Huddle (USA). 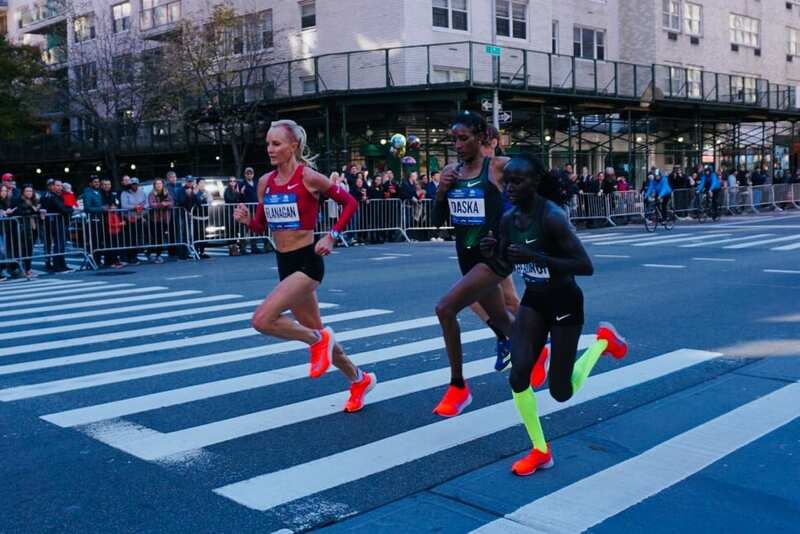 Although the women’s race was stacked with an impressive field of U.S. women, it was three-time NYC Marathon champion Mary Keitany who reclaimed the crown in a blazing 2:22:48. Cheruiyot finished second in 2:26:02 and Flanagan took third in 2:26:22, adding bronze to her collection of gold and silver NYC Marathon medals. Behind Flanagan, Huddle took fourth and was followed by compatriots Des Linden (sixth) and Allie Kieffer (seventh). Following the women came the lead male runners, including Shura Kitata (ETH), Lelisa Desisa (ETH), defending champion Geoffrey Kamworor (KEN), Tamirat Tola (ETH) and Festus Talam (KEN). In the final miles of the race, it was down to Desisa, Kitata and Kamworor. Although Kamworor increased the pace in an attempt to drop Desisa, it was Desisa who literally tossed his hat and surged forward. 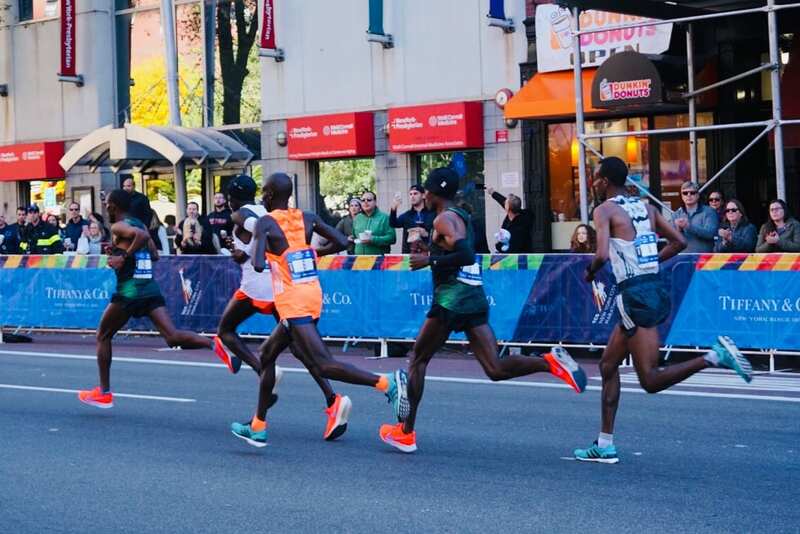 Kitata had fallen slightly back at mile 25 but still had something left, passed Kamworor and came within reach of Desisa, but Desisa was able to hold him off to win the race in an impressive 2:05:59. Kitata took second in 2:06:01 and Kamworor placed third with a time of 2:06:26. Four U.S. runners finished in the top 10, including Jared Ward, Scott Fauble, Shadrack Biwott and Chris Derrick. Long after the elites were done, droves of runners poured into Central Park and crossed the finish line. They kept coming and coming well after dark until the final participants finished, many with their own inspiring stories. Kudos to all of the runners, spectators, volunteers and first responders who gave it their all, motivated the athletes to keep going and kept everyone safe. What a fantastic event—one well worth celebrating! Thanksgiving Foods: To Eat or Not to Eat?